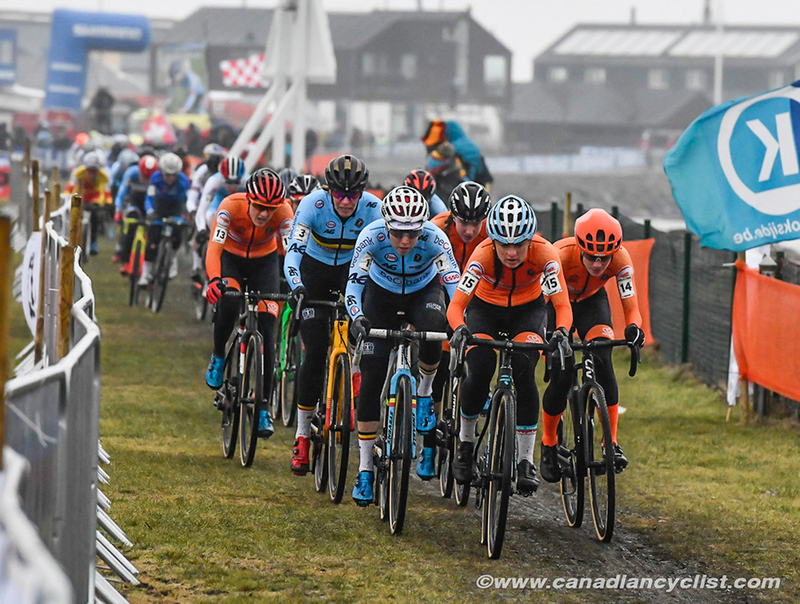 Three titles were awarded on the first day of the UCI Cyclo-cross world championships in Bogense, Denmark, with British riders taking two and Belgium one. 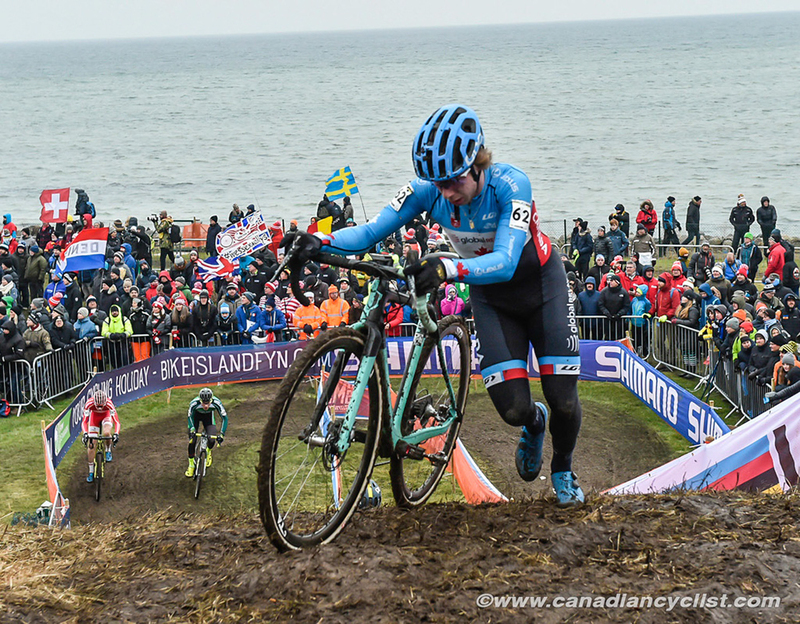 Canadian champion Maghalie Rochette had the top Canadian result of the day, finishing 23rd in the Elite women's race. 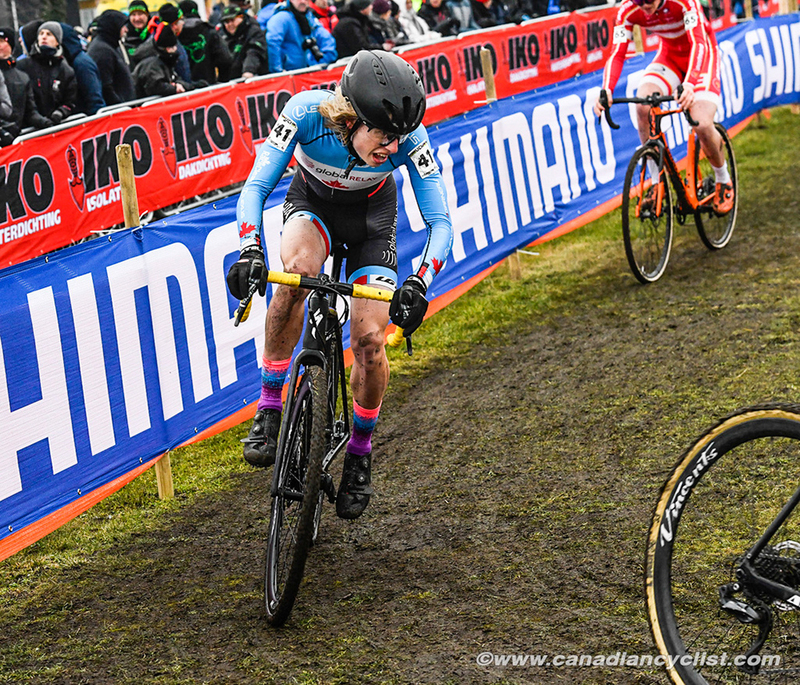 Rochette admitted before the race that she has been struggling of late, with illness restricting her training in the two weeks leading up to the Championships. 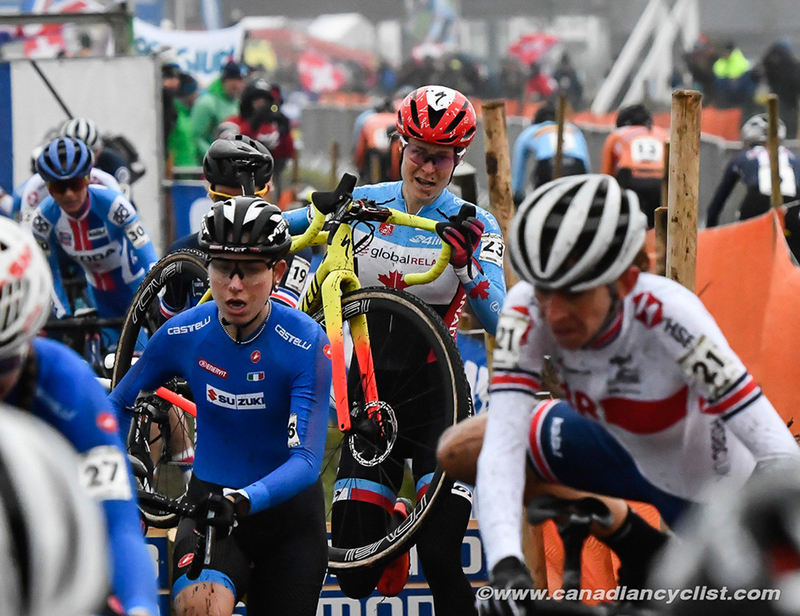 The Pan American and Canadian champion had a strong start, but faded to the mid-20s by the end of the first lap, and would remain in that position for the rest of the race. "I've been sick for the last two weeks, and my training plan was to just try and recover," said Rochette. "All I've been doing is an hour easy on the trainer every day. But, I'm happy about my ride; I couldn't do any better. It was a real power course and the other girls were super strong. It's just a reminder that if you want to be competitive you have to bring your 'A' game. I didn't have that today, but I did the best I could with what I had." 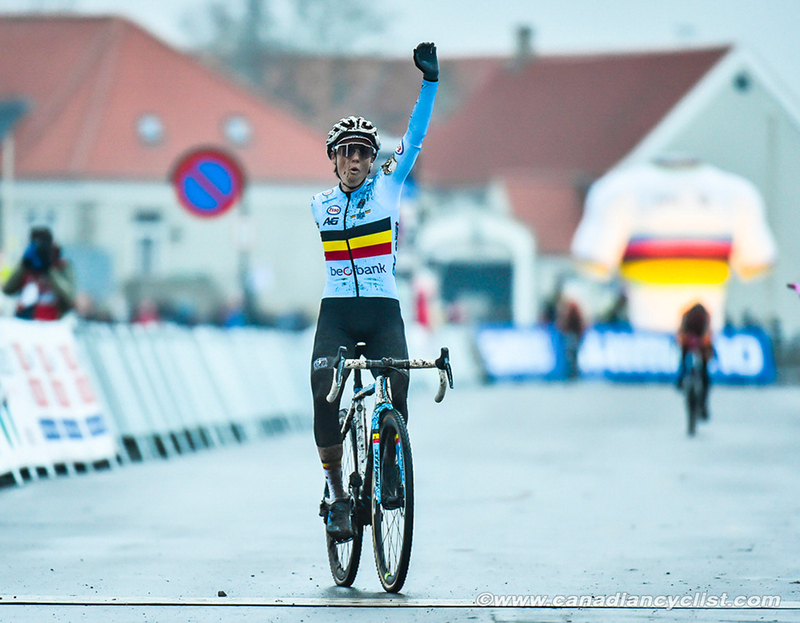 The race for the title came down to two-time defending champion Sanne Cant of Belgium against four Dutch riders. Swiss mountain bike star Jolanda Neff managed to make her way up to the leaders after starting well back, but then faded in the final laps. 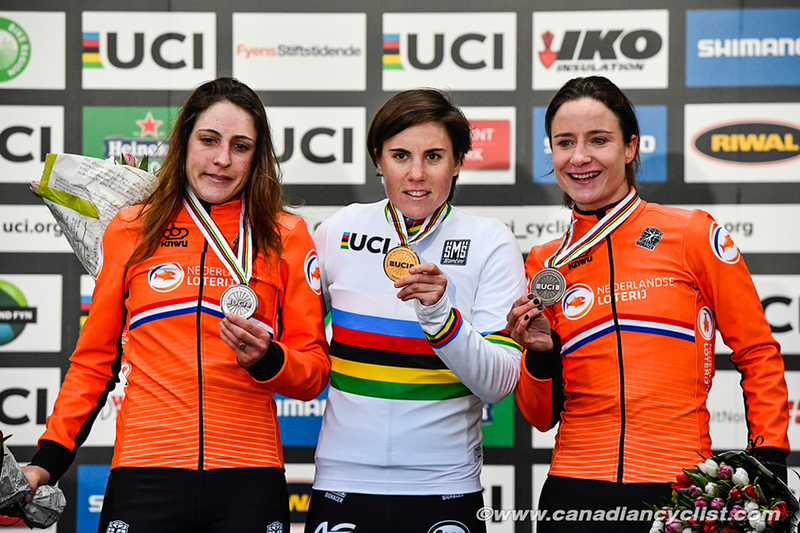 After five laps, it was Cant facing Dutch riders Lucinda Brand Denise Betsema and Annemarie Worst, with seven-time world champion Marianne Vos at seven seconds. Cant opened it up on the next lap and the Dutch could not respond in the final two laps, with Cant taking her third consecutive title ahead of Brand and Vos. "It was a really fast race, but a lot of wind," said Cant. "It was a tactical race because I was with three or four Dutch riders, so I had to be smart. I had just a small gap, so it was difficult to decide whether to wait or try to stay in front. But it turned out to be the right tactic. This is just amazing to win [for a third time]. I'm a Belgian rider in front of four Dutch riders; I answered with my pedals." 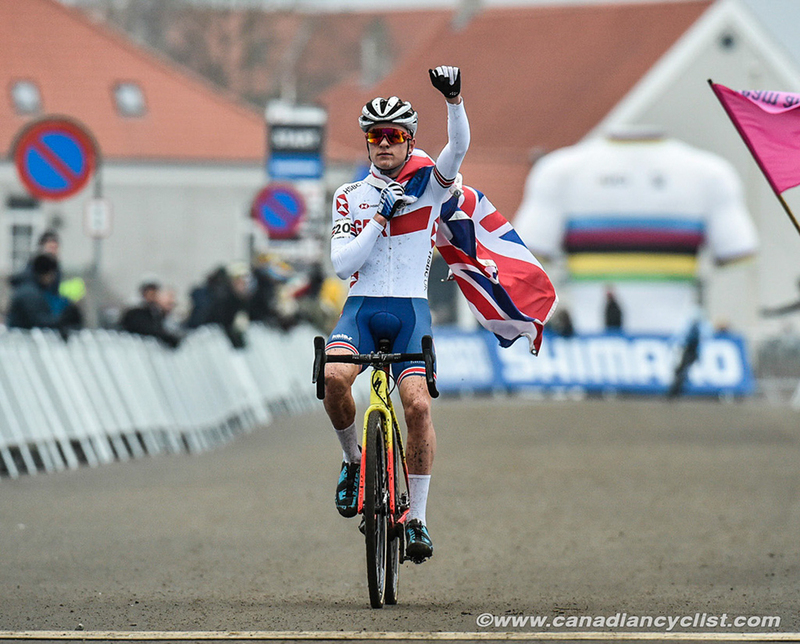 The Under-23 and Junior mens races followed a similar pattern, with a British rider riding away from Belgians to win the title. In the Under-23 race it was former Junior champion Thomas Pidcock beating defending champion Eli Iserbyt, while his countryman Ben Tulett won the Junior title ahead of Witse Meeussen. 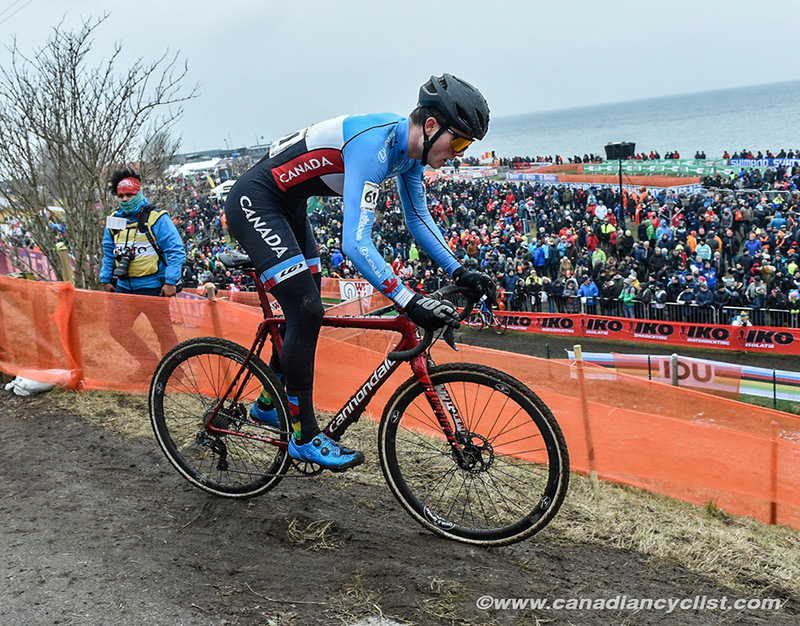 Canadian Under-23 champion Gunnar Holmgren finished 28th and Tyler Orschel was 43rd. 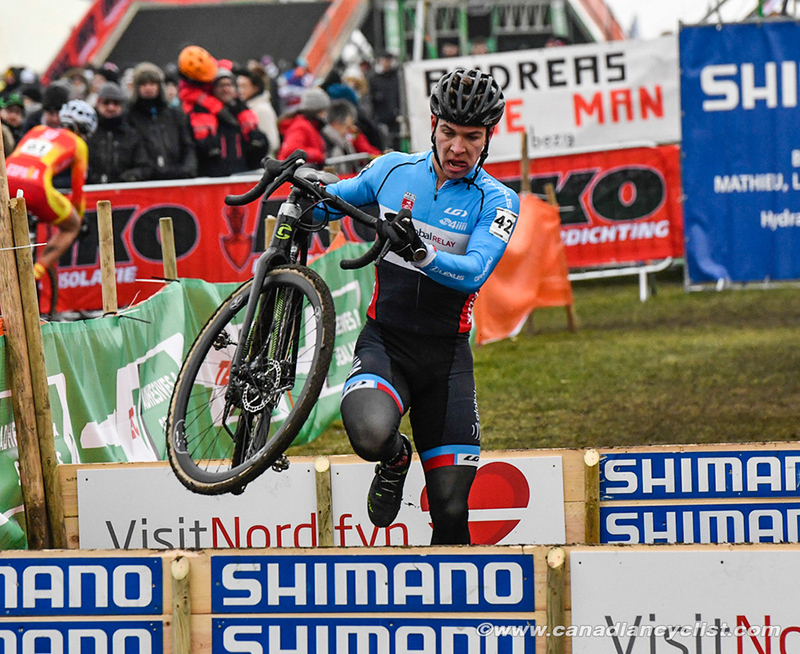 For Holmgren it was strong but disappointing ride after a crash on the first lap dropped him to the back of the field. He rode strongly to pass more than half the field. "It was a little disappointing," admitted Holmgren. "It was a pretty crazy start with a long straightaway. It was slick and I don't think some riders were prepared for it, and I got tangled with some other riders and went down. I managed to get the most out my legs and moved through a bunch of guys. It was the first night this week that it didn't go below zero, and the ground melted a bit and it got a little slick. I felt good about my ride; I didn't give up and I think I put on a good show for everyone who came over here from Canada." Connor Martin was the top Canadian rider in the Junior competition, finishing 46th. Paul Mysko was 63rd. "It really was fast out there, from start to finish," said Martin. 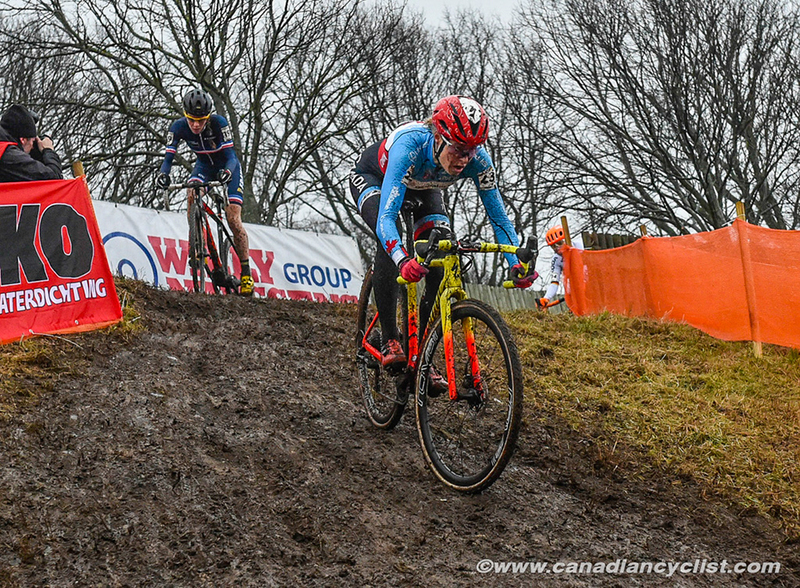 "On the first lap, on the off-camber section, there was a bit of a pile up, and I tried to scoot around, but I hit a patch of ice and went down. I was passing some guys in the first laps and then holding position, but in the last half lap I ran out of gas a bit. I would have liked to do a little better, but I'm pretty happy overall."